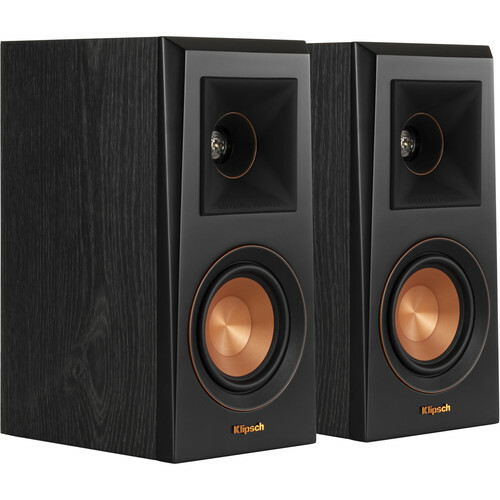 Suitable for use in various settings, this pair of Klipsch Reference Premiere RP-400M 2-Way Bookshelf Speakers can handle up to 50W per channel RMS or 200W peak and are equipped with a 4" Cerametallic cone woofer and a 1" titanium LTS vented tweeter paired with a 90 x 90° hybrid cross-section Tractrix horn for broad directionality. 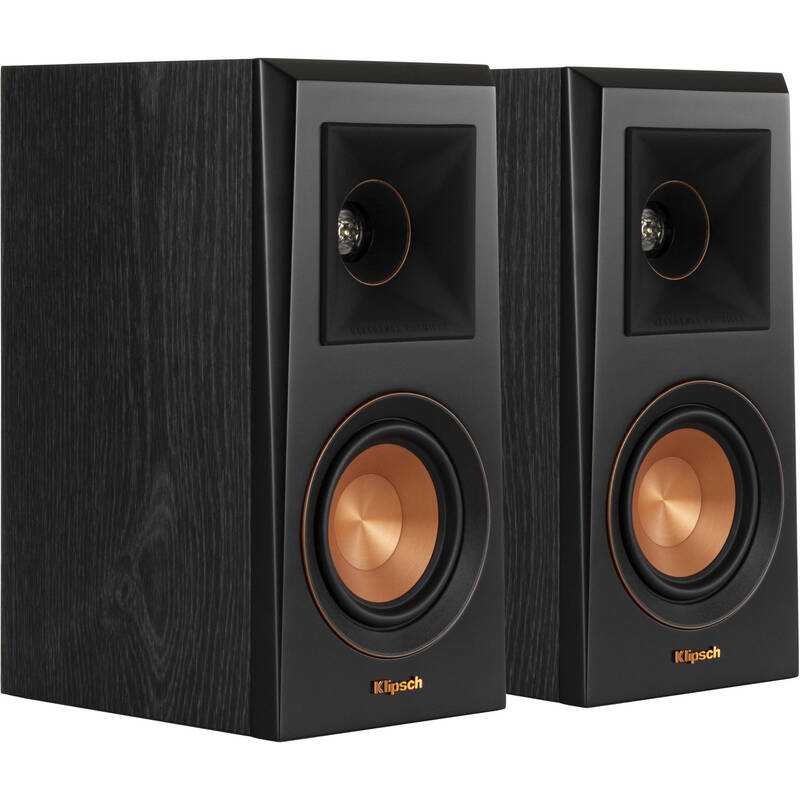 They have a frequency response of 52 Hz to 25 kHz and feature a keyhole for convenient wall mounting. The Tractrix horn is designed to ensure that the high-frequency energy is aimed at the listener and to reduce artificial reverb or filtering caused by indirect sound bouncing off walls, while the phase plug and compressed molded silicone face help ensure smooth frequency response. These technologies combine to help provide a clean, natural sound, while the phase plugs also help protect the tweeters from damage. The LTS tweeter helps minimize distortion for enhanced, detailed performance, thanks in part to the piston motion of the diaphragm. The vented tweeter housing helps reduce standing waves that create unwanted harmonics, further augmenting detail and clarity in high frequency reproduction. Cerametallic woofers are designed to be light and rigid to help provide minimal distortion and maximum efficiency. The cones are mated to a dual-layer, copper-wound voice coil for enhanced conductivity and are housed in a non-resonating, stamped-steel basket for augmented efficiency and low distortion. The binding posts accept banana plugs or bare wire up to 12-gauge for flexible connectivity options, while the color coding helps simplify setup and connection. Utilizing Tractrix geometry, the Reference Premiere ports allow for efficient, fast air transfer from the cabinet, which helps reduce port noise for punchy low frequencies. Klipsch Tractrix ports have inner flares that help reduce air turbulence entering the port, further helping to reduce port noise for cleaner, more powerful bass. The Reference Premiere features a scratch-resistant vinyl finish with a satin-painted baffle. The included grilles attach magnetically to help provide a quick and simple change of aesthetics. Box Dimensions (LxWxH) 16.12 x 16.0 x 12.6"